I wanted to share the different breeds of chickens I ordered. They will be arriving the week of September 19th. That is actually there "hatch date". They should arrive on the 20th, if they don't go through the nightmare travels throughout Michigan that the first batch went through. I ordered two from the Polish breed. They have no origins with the country, but they do have a wonderful full crest of feathers on their heads. The first is a Buff Laced Polish. Buff being the color, laced is the white around the edge of the feathers. Isn't she stunning! I just love the polish breed. 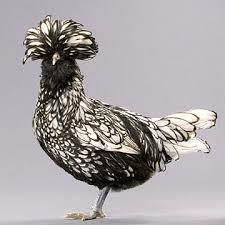 To me they are the drag queens of the chicken world. So much extra pizzazz! Unfortunately that crest makes for a very blind sighted bird! The second Polish breed is a Silver Laced Polish. Another beautiful coloration of the breed. I do plan on making sure their crest is trimmed so their eyesight is not as impaired. If you were going to keep these breeds for show you would not want to trim the crest, but for my eclectic backyard flock, trimming will be fine. 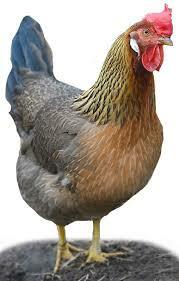 Next we have a Light Brown Leghorn. Leghorn breeds are the standard breed used in commercial egg factories. Think...Warner Brothers...Foghorn Leghorn!! There are a lot of color varieties of this breed, the light brown being one of them. She reminds me a little of the coloration on Queen Ann, the Cream Legbar. 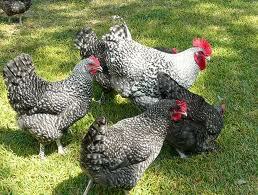 Last we have the Silver Cuckoo Marans. I really wanted a Marans breed, they have the dark chocolate colored eggs. Some will have darker egg shells than others, but I wanted one of these to add to the eclectic colors for my egg collection (when that starts!!) 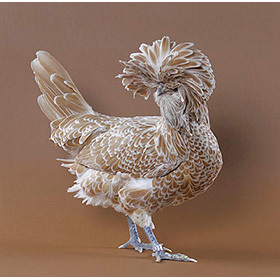 Silver Cuckoo is just one of the many colors varieties this breed comes in. I know your already wondering about names for these future residence of Chicken Peck Farm! We will just have to do another blog/facebook posting after they arrive and start to show a little personality! The current flock is doing well. They really enjoy the moments that they get to run free in the yard when I am home. I am also pleased to say that Laverne has finally roosted on her own. She does not reach the main roost with the rest of the flock but she makes it up to the loser roost! This is a huge accomplishment. Every night I would have to go out when I closed up the coop and lift Lavern onto the roost. Its a huge step her her independence that she figured out how to get to the other roost! I am going next Saturday to the feed store to get Layer feed! The girls (and Bert) are of the age to start layer feed to help with egg development! Eggs will be coming soon! !